This reptilian race, well-suited for the treacherous swamps of their Black Marsh homeland, has developed a natural resistance to diseases and the ability to breathe underwater. They can call upon the Histskin to regenerate health very quickly. 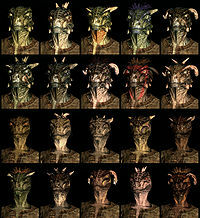 Resist Disease ability (FormID 00104acf): Your Argonian blood is 50% resistant to disease, constant. Waterbreathing ability (FormID 000aa01b): Your Argonian lungs can breathe underwater, constant. Histskin greater power (FormID 000e40d5): Invoke the power of the Hist to recover health ten times faster for 60 seconds, once per day. Raw DietCC (FormID: xx00088d): Your Argonian blood allows you to eat raw meat without risk of disease. Weakness to ColdCC (FormID xx000875): Argonians become colder 25% faster in cold environments. Argonians make good thieves, as they have the right stat boosts. The underwater breathing makes them good underwater treasure hunters and fishers; it also provides them with a good way to escape enemies by swimming. A +5 boost to Alteration and Restoration gives them good magical potential. Their claw bonus also helps them win brawls. Their Histskin power plays a vital role (particularly in early gameplay), saving players from near death against more powerful opponents by making them essentially invincible for a minute. Being taunted You'll make a fine pair of boots, lizard!" When happening upon a dead body "Hss! Dead. Who did this?" Detected pickpocketing (by another race) "You dirty filching lizard!" Argonians are no longer resistant to Poison as they were in previous games. If you put on a Shrouded Cowl (with the mask) and the character has horns, the horns disappear, with no head gear shown. Argonians are unable to use Disarming Bash unless they're a vampire. Decapitating a male Argonian will cause the skin texture on his head to disappear with the eyes, mouth, and horns still remaining. This page was last modified on 20 April 2018, at 15:45.